Putting pacemakers and defibrillators into an antibacterial, absorbable envelope protects patients, study shows. The study involved an antimicrobial mesh envelope to cover the implanted heart-assist device. Among the 1.7 million patients implanted globally every year with heart defibrillators and pacemakers, postoperative infections are a major concern. Although studies have reported low infection rates with these devices – between 1 percent and 4 percent of patients – the consequences are profound in terms of death and injury. “Patients require a complete extraction of their device system when it becomes infected – a procedure that carries a small, but serious risk of tearing the heart,” said Jeanne Poole, a UW Medicine cardiologist and professor of medicine at the University of Washington School of Medicine. UW Medicine cardiologist Jeanne Poole was a co-principal investigator in the trial. In a study published March 17 in the New England Journal of Medicine, Poole and colleagues reported that wrapping the defibrillators and pacemakers in an antibacterial, bio-absorbable mesh envelope during the implantation significantly reduced the rate of infections experienced by patients in the following year. 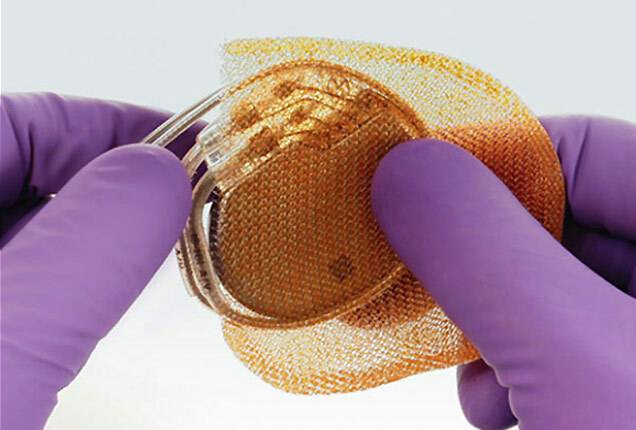 The three-year clinical trial spanned 181 clinical sites and involved 6,903 patients, who were randomized to receive the palm-size envelope, or no envelope, with their device implants. The trial’s average patient age was 70 – in line with the general population of people who receive these devices. The mesh envelope, manufactured by Medtronic, is impregnated with two antibiotics, minocycline and rifampin. For about a week after implantation, these drugs suffuse the pocket of tissue created under the skin of the chest to hold the device. By about nine weeks later, the envelope is fully absorbed into the body, leaving no trace. The researchers studied two groups: patients who were receiving a replacement device for a previously implanted pacemaker or defibrillator, and patients being implanted for the first time with a defibrillator that had three leads (electrical wires). Devices can include from one to three leads depending on what the patient needs, Poole said, and data associates a higher number of leads with higher risk of infection. Most implant-related infections comprise dangerous Staphylococcus bacteria, Poole said. A small minority of cases arises acutely in the first week or so, and most often involve Staph. aureus. The majority of infections, however, involve Staph. epidermidis, a slower growing bacteria that commonly emerges months later. That’s why this study followed the patients for one year postoperatively, she said.